Bai YunYun, a Certified Zentangle Teacher (CZT) from China, approached me in September last year asking whether my mother and I would like to be featured in a book that she was writing. I was thrilled, and agreed in a heartbeat. 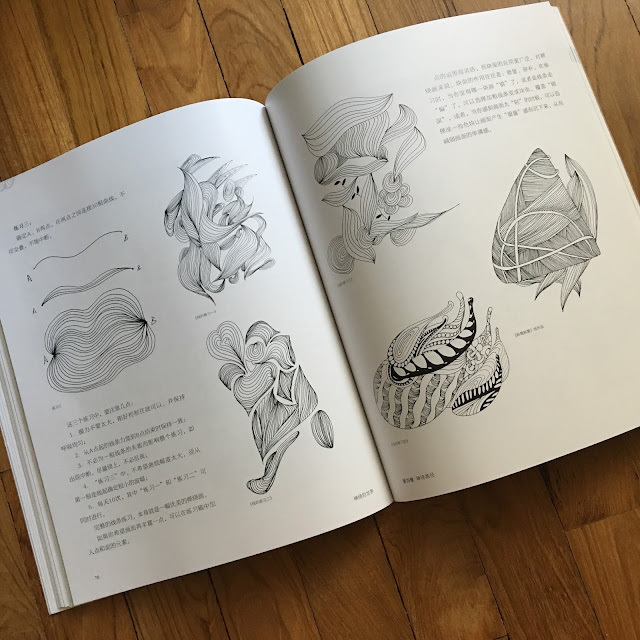 It took these many months for the book to be completed and printed, then sent from China to Singapore, but I must say that it definitely was worth the wait. 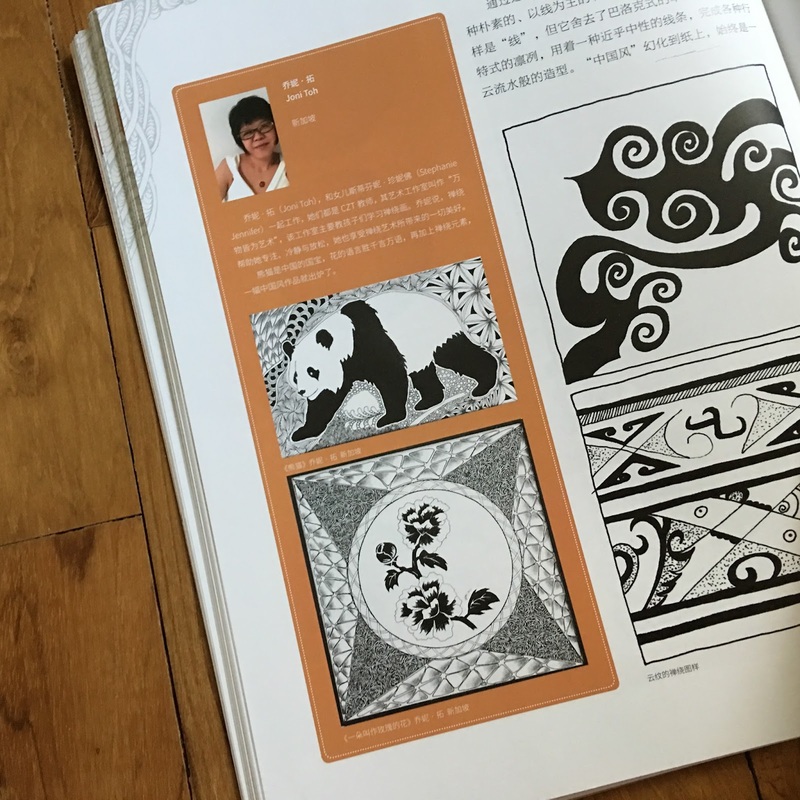 "World of Zentangle" is a beautifully printed book. The pages are set out wonderfully. It doesn't look cluttered, the text is easy to read, and all the pictures in the book are lovely and sharp. The cover is a sturdy cardboard material that is the colour of Zentangle®'s renaissance tiles. 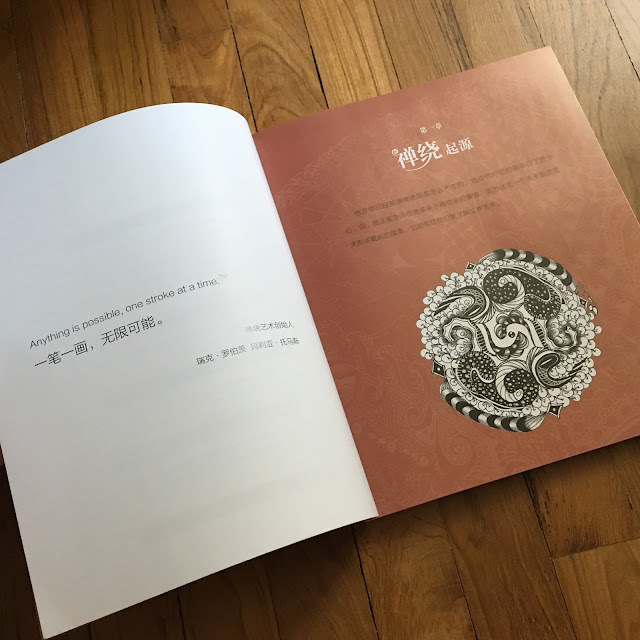 It has a nice border of tangles and the Chinese title of the book is printed in white ink that makes it seem like it is slightly embossed. 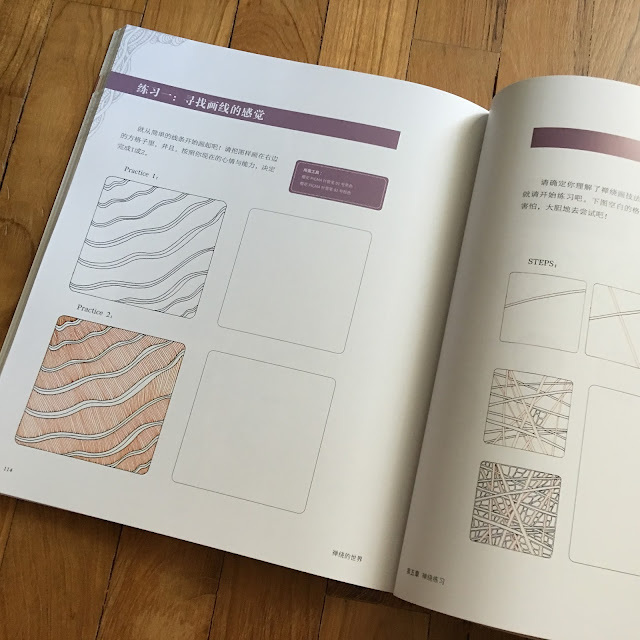 The pages have a slight gloss and the book is printed in full colour. Each chapter is colour coded, which I find really useful for finding a particular section when I want to. First chapter... And with the Zentangle motto: "Anything is possible, one stroke at a time." The book is filled with plenty of pictures of YunYun's own art works, examples of patterns, and pictures related to what she's talking about on any given page. 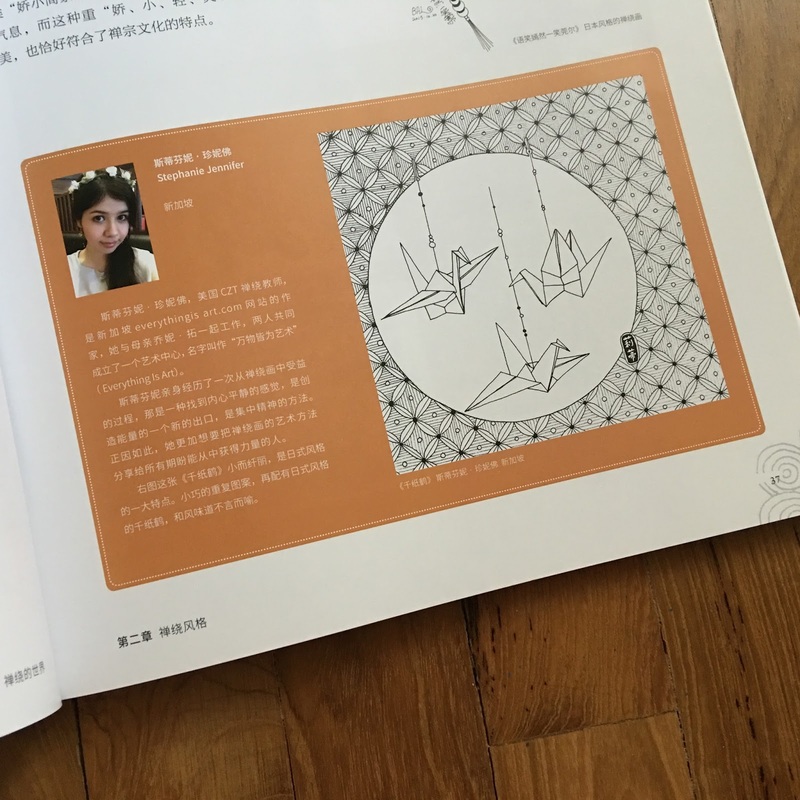 Eight other artists were featured in the book, of which my mother, Joni, and I am included. We truly are honoured to be included in such a wonderful creation. Here's the section that I was included in. And a spread from the last chapter, where there are step-outs to a few tangles and empty boxes that you can draw in. It's truly a blessing for us to have received a copy of this book because we're planning to teach Zentangle classes in Mandarin soon and we wanted to be sure that we would be teaching the Zentangle method using the correct words. This book will really help us. I hope you enjoyed reading my review of "World of Zentangle". 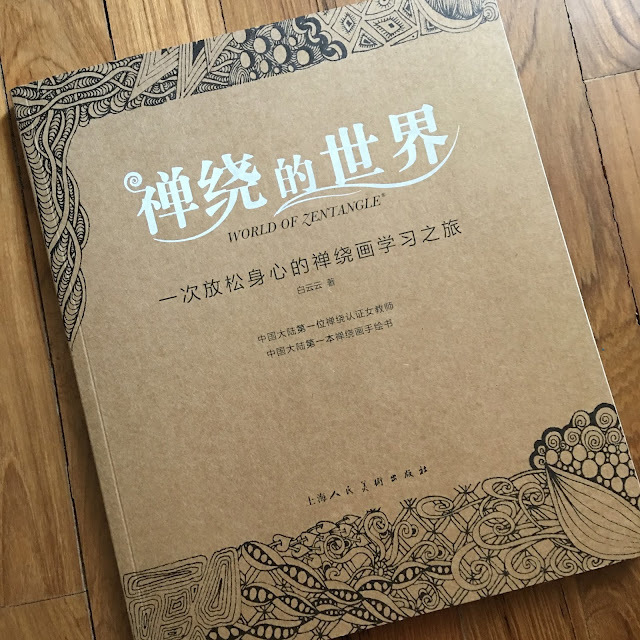 If you have Mandarin speaking students, this book will be a great purchase. Or if you're like me and just like to collect books about Zentangle, you can currently purchase the book through Dang Dang or through China's Amazon.